Lions and Gargoyles and… Hot Chicks? 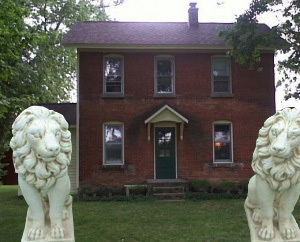 There’s a few houses around my area that have large cement statues of lions or gargoyles in front of them. Now guarding your home with large cement statues if you have a lot of money and prestige, I guess is okay… but these folks have meager ranch houses that really are uncharacteristic of such statuesqueness. What kind of an egotistical douchebag would you have to be to put these atrocities in front of your house. 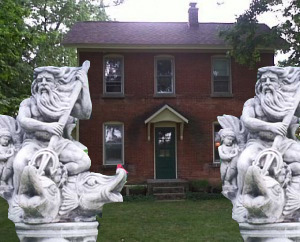 So, I decided since I’m a very famous, high profile blogger, I thought I might put some large cement statues in front of my house. I went to my local cement statue retailer and discussed this with them. 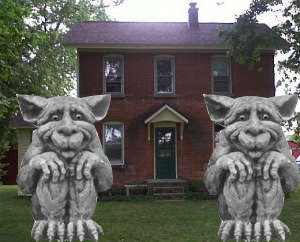 As they have had issues with people making rash decisions like buying gigantic lions and getting them home and realizing that they were too big for their double wide, they made me go through an extensive interview process to be sure that I picked the proper cement statues. In addition they were able to give me some mock-ups and product descriptions of a few of my top choices so that I could make an educated decision as to which would be best suited for my particular needs. I’m hoping you can offer some feedback as to which you think is best. Our #1 best selling statues! Gargoyles are a good choice for neighborhoods, or homes in the country. Able to ward off all kind of solicitors including Jehovahs, vacuum salespeople and Girl Scouts. A Best seller! Show up your neighbors by surrounding your driveway with these elegant Lion statues. If you didn’t feel like the king of your jungle before hand, you will now! Guaranteed to give you the hard earned reputation of biggest prick on the block… and who wouldn’t want that? Who doesn’t love the God of the Sea? These statues will make you feel like the God of your neighborhood. Special bonus: Comes with your own personal Trident that you can use to stab the neighbor kids when they trespass in your yard! Are you man enough to have these two hot chicks gracing your front yard? Show the guys in your neighborhood who wears the pants in your relationship. Or in the case of these statues, who doesn’t wear the pants! Let me know what you think, I hope to have these delivered next week! Have you heard the tall tale ’bout Slobenia Isle? It sat off the coast of Shipshape, ‘bout a mile. A slobby old place, always in disarray. Messy and dirty most every day. Slobenia Isle was a land full of kids. Steven’s and Sally’s and George’s and Sid’s. And Kelly’s and David’s and Rachel’s and Jimmy’s. And Bobbie’s and Mary’s and Jenny’s and Timmy’s. And Freddie’s and Debbie’s and Kenny’s and Anne’s. And Tracy’s and Tommy’s and Susie’s and Dan’s. And Mary’s and Bryce’s and Kimberly’s too. And Ronald’s and Jenny’s and even a Sue. Amongst dirty dishes and clothes in a pile. Their socks and their underwear strewn ‘bout the street. And all of the trash from the foods that they’d eat. But the Slobs, well it seemed that they just didn’t care. The extent of this problem, they just weren’t aware. Somehow they just didn’t want to address. This ugly, egregious, perpetual mess. Now the Slobs, they were ruled by the King and the Queen. Of the land of Shipshape which was always kept clean. Spotless and sparkly, tidy and trim. Each thing in its place, proper and prim. Shipshape was a land of persnickety folks. Fastidious ladies and punctilious blokes. Neat-niks and nit-picks, they were always convening. To delegate out the next week’s worth of cleaning. Who’d do the laundry and vacuum the rugs? Who’d do the dusting and clean up the bugs? Who’d wash the dishes and who’d scrub the floors? With a sponge and a bucket, down on all fours? Who’d sweep the porches and who’d clean the sinks? Who’d wash the toilets that were all full of stinks? Who’d wash the windows, sparkly and clean? Who’d scrub the stove to bring back its sheen? They’d always be scolding those Slobs ‘cross the sea. But the Slobs didn’t like these tyrannical rules. They felt that the laws of Shipshape were for fools. So they all stood together, in their town square. Amongst all the dirt and the grime and pet hair. They agreed to resist the laws of Shipshape. The rules and the edicts and stifling red-tape. So, the Kind and the Queen, they prepared for a fight. To clean up Slobenia Isle and it’s blight. They loaded up trash bags and cleaning supplies. They mapped out a plan that would surely surprise. They filled up their ships and they took to the seas. They sailed towards Slobenia with no guarantees. Filled with foreboding and deep apprehensions. Prepared for a battle of epic dimensions. Now the Slobs, they had lookouts scanning the shore. They knew the Shipshapes were preparing for war. So they summoned their soldiers, they sounded alarms. They built up their beaches with weapons and arms. Then they waited until the Shipshapes were approaching. ‘Til the King and the Queen and their ships were encroaching. When the moment was right, with a mighty decree. They fired their weapons out towards the sea. Their cannons fired dirty old socks through the air. Their trebuchets flung lots of old silverware. And dishes and glasses and clothes that were soiled. And garbage and trash and food that was spoiled. But the King and the Queen would not stand for losing. This was a war, of course of their choosing. And though they could sense that this crisis was dire. They kept sailing on through this curtain of fire. This battle went on for days upon days. But the Shipshapes sailed on through the harrowing haze. When they finally arrived on Slobenia Isle. They saw all the Slobs and their rank and their file. The King and the Queen, were silenced of speech. They’d once been kids too, running ‘round on this beach. And a chink in their armor started to crack. As childhood memories came flooding back. “Well you do have a point”, they said to the Slobs. So the King and the Queen, they scheduled a meeting. Around a big table with plenty of seating. They invited the leaders of Slobenia Isle. The plan was to compromise once in a while. They wrote up a truce that they all had to sign. In bright purple pen on the signature line. A truce that would end this unfortunate brawl. A truce that would end this war once and for all. The Slobs, they agreed to give it their best. To keep their isle clean at their leaders request. To pick up their clothes, to clean up their trash. With the hope that they’d build up a small stash of cash. And that’s the tall tale ‘bout Slobenia Isle. That sat off the coast of Shipshape ‘bout a mile. An island whose residents just want to play. And a place that’s no longer a mess every day. If I could live in any place, which place would it be? Paris, France or Ireland or Southern Italy? I’d choose Michigan, right where we’ve been, as long as you’re with me. If I could live in any house, which house would it be? A mansion in the mountains or a lighthouse by the sea? Our old house, is where I’d espouse, as long as you’re with me. If I could drive in any car, which car would it be? A Beamer on the Autobahn or a car in the Grand Prix? I’d pick my old truck, with any luck, as long as you’re with me. If I could float in any boat, which boat would it be? A paddlewheel on a river or a schooner on the sea? An old canoe, would certainly do, as long as you’re with me. If I could rest in any chair, which chair would it be? A throne inside a castle or a seat at the symphony? Nothing compares, to rocking chairs, as long as you’re with me. If I could eat any meal, which meal would it be? Boiled lobster on the beach or hors-d’oeuvres with wine and brie? I’d eat a PB&J, on a rainy day, as long as you’re with me. If I could choose any drink, which drink would it be? A Margarita by a sunny pool or a fruity Daiquiri? I’d just fill up, my coffee cup, as long as you’re with me. If I could live to any age, which age would it be? All the way to Ninety or perhaps One Hundred and Three? Age can’t be guessed, though I’ll be blessed, as long as you’re with me. Our old house is sometimes creaky. We love it still with all its quirks. So long as all the plumbing works. We live there happily undaunted. Although we’re told the house is haunted. Our guess is that it’s just a hoax. Though spirits are elusive folks. There’s a story ‘bout a ghost that’s told. She harkens from a time of olde. We think her name is Abbie Hill. Albeit we haven’t seen her still. See, Mrs. Hill and her loving spouse. They used to own this big old house. They built it as their family grew. than head off where she should be bound. The answer, surely no one knows. But this is how the story goes. The previous owners told this tale. To us, before we closed the sale. They saw her at their kitchen table. They swore this story was no fable. She sat there in a kitchen chair. A fancy bun up in her hair. She wore a nineteenth-century dress. Her image had a slight fluoresce. Then just as fast as she’d appeared. It took all of their common sense. To explain this strange experience. Then one night as the wife was sleeping. at her, as she lay in bed. A sight that filled her up with dread. as she played this game of brief revealing. Then with a touch of Laissez Faire. She vanished quickly in the air. So when we heard this new disclosure. We had to keep our strict composure. We loved this house with all our might. Why worry about a ghostly sight? We bought the house with nervous laughter. And moved our stuff in shortly after. We’d see our ghostly resident. But so far she has not presented. To share this house on old Brown Road. This home with which we’ve been bestowed. And now we’ve lived here many years. Shared smiles and laughs and hugs and tears. Regardless if we’re rich or poor. We hope we’ll live here many more. And if our ghost decides to show. In all her radiance and glow. I guess we’ll have to let her stay. To haunt us for another day!